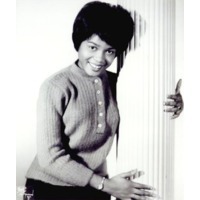 Eva Narcissus Boyd (June 29, 1943 – April 10, 2003), known by the stage name of Little Eva (after a character from Uncle Tom's Cabin), was an American pop singer. Born in Belhaven, North Carolina, she moved to the Brighton Beach section of Brooklyn, New York at a young age. As a teenager, she worked as a maid and earned extra money as a babysitter for songwriters Carole King and Gerry Goffin. It is often claimed that Goffin and King were amused by Boyd's individual dancing style, so they wrote "The Loco-Motion" for her and had her record it as a demo (the record was intended for Dee Dee Sharp). However, as King said in an interview with NPR and in her "One to One" concert video, they knew she could sing when they met her, and it would be just a matter of time before they would have her record songs they wrote, the most successful being "The Loco-Motion". Music producer Don Kirshner of Dimension Records was impressed by the song and Boyd's voice and had it released. The song reached #1 in the United States in 1962. It sold over one million copies, and was awarded a gold disc. The two songwriters also wrote the song "He Hit Me (It Felt Like a Kiss)", performed by The Crystals, after Boyd revealed that her boyfriend regularly beat her. When asked why she put up with it, she replied that it showed that he loved her. After the success of "The Loco-Motion", Boyd was stereotyped as a dance-craze singer and was given limited material. Boyd's other single recordings were "Keep Your Hands Off My Baby", "Some Kinda Wonderful", "Let's Turkey Trot" and a remake of the Bing Crosby standard "Swinging on a Star," recorded with Big Dee Irwin (though Boyd was not credited on the label). Boyd also recorded the song "Makin' With the Magilla" for an episode of the 1964 Hanna-Barbera cartoon series The Magilla Gorilla Show. She continued to tour and record throughout the sixties, but her commercial potential plummeted after 1964. She retired from the music industry in 1971. She never owned the rights to her recordings. Although the prevailing rumor in the 1970s was that she had received only $50 for "The Loco-Motion," it seems $50 was actually her weekly salary at the time she made her records (an increase of $15 from what Goffin and King had been paying her as nanny). Penniless, she moved her three young children to South Carolina, where they lived in obscurity on menial jobs and welfare. Interviewed between 1987 and 1988 after the success of the Kylie Minogue cover version of "The Loco-Motion", Boyd stated that she did not like the new version; however its then-current popularity allowed her to make a comeback in show business. She returned to live performing with other artists of her era on the cabaret and oldies circuits. She also occasionally recorded new songs. She continued performing until she was diagnosed with cervical cancer in October 2001. She died 18 months later in Kinston, North Carolina, aged 59, and is buried in a small cemetery in Belhaven, North Carolina. Her gravesite was sparsely marked until July 2008, when a report by WRAL-TV of Raleigh, North Carolina highlighted deteriorating conditions at the cemetery and efforts by the city of Belhaven to have it restored. A simple white cross had marked the site until a new gravestone was unveiled in November of that year.